The polyphenol rich whole food supplement Pomi-T® proven to have a direct anti-cancer effect in men with prostate cancer. Summary of the National Cancer Research Network double-blind placebo controlled randomised Pomi-t trial. Robert Thomas1,2,3 Madeleine Williams1, Habinda Sharma1, Assim Chaudry2, Pat Bellamy3 1The Primrose Research Unit,Bedford Hospital, 2Oncology Department, Addenbrooke’s Cambridge University NHS 3 Trust, 3Department of postgraduate Medicine,Cranfield University. The pom-t trial was approved by the National Ethics Committee, peer reviewed by National Cancer Research Institute (NCRI) Complementary Therapies Research Committee and adopted by the National Cancer Research Network. Financial supported was provided by the charity Prostate Action and the Primrose Oncology Research Fund. It received no commercial funding. The randomisation process was outsourced and independently audited by an external agency to ensure adherence to European Good Clinical Practice Guidelines. 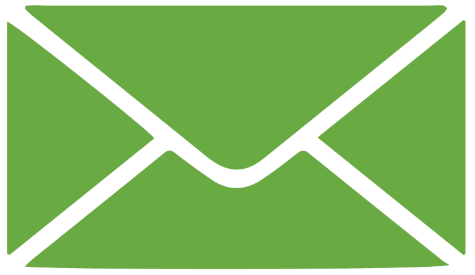 The data was externally audited before independent analysis at Cranfield University. Polyphenol-rich foods, such as pomegranate, green tea, turmeric and broccoli, have demonstrated anti-cancer effects in laboratory studies. In humans, observational studies have linked their intake with a lower risk of chronic disease, including cancer. Concentrating these foods into a capsule is a conveniently way to boost an individual’s polyphenol intake but hitherto clinical studies have not firmly established that these benefits health or markers of cancer progression. Men with prostate cancer, managed with active surveillance (AS) or watchful waiting for a PSA relapse after radical treatments, are an ideal cohort to evaluate a lifestyle intervention as they have a useful serum marker of their disease (the PSA). In addition, medical interventions are often not indicated initially upon relapse. Furthermore, these men appear to have a great interest in self-help remedies as reports indicate that 50-70% of men with prostate cancer admit to taking over-thecounter supplements. To determine whether a polyphenol rich food pill influenced the rate of PSA progression amoung men treated with active surveillance or watchful waiting versus a placebo. 203 men, aged 53-89 yrs (av.74 yrs), with histologically confirmed prostate cancer were evaluated in this double blind randomised placebo controlled trial. 59% were being managed with primary active surveillance (AS) or 41% with watchful waiting (WW) with a progressive PSA relapse following previous radical interventions. They were randomised to receive a twice a day oral capsule containing a blend of pomegranate seed, green tea, broccoli and turmeric or an identical placebo for 6 months. The randomised process produced no statistical difference in gleason grade, body mass index (BMI) or treatment category although men were slightly older in the placebo group (72 years versus 76 years). Four men withdrew after randomisation, started androgen therapies so were not included in the statistical evaluation. Percentage rise in PSA: The median percentage change in PSA for patients in the Pomi-T group was a rise of 14.7% (95% CI 3.4%-36.7%), compared to a rise of 78.5% (95% confidence interval 48.1% -115.5%) for patients in the placebo group. 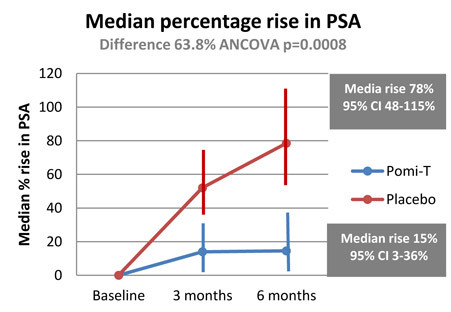 The median PSA increased at a significantly slower rate in the Pomi-T group compared to men taking placebo (difference of 63.8% ANCOVA, p=0.0008). 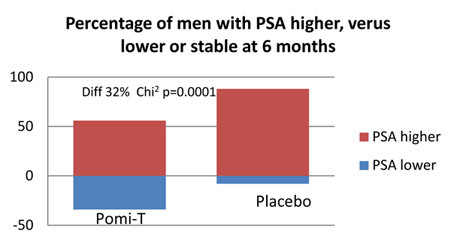 Percentage of men having a stable or a lower PSA at the end of the study: At trial completion, the number of men with a stable PSA or a lower PSA was 61 (46%) in the Pomi-T group, compared to 9 (14%) in the placebo group. This difference was statistically significant (Chi-squared value with 1 degree of freedom = 19.58, p=0.000010). Percentage of men in whom Pomi-T prevented a change in management: One hundred and fourteen (92.6%) men in the Pomi-T group continued surveillance or WW at the end of their involvement in the study, as opposed to 38 (74%) in the placebo group. This difference of 18.6% was statistically significant (p=0.01). Subgroup analysis: There was no significant difference in the median change in PSA from baseline to 6 months in the Pomi-T or placebo group between any of the pre-determined subgroups (BMI, Gleason grade, age or treatment category). There were no significant differences at the beginning or the end of the study between the subgroups for measures of cholesterol, blood pressure, serum glucose or C-reactive protein. Side effects, safety and drug interaction: Pomi-T was well tolerated with no repored central nervous system symptoms, such as agitation, insomnia or tremors. None of the men on warfarin reported any unexpected changes in the INR or blood pressure whilst on ramipril. 12% of men in the Pomi-T group and 4.6% men in the placebo reported positive effects; 24% men in the Pomi-T group and 34% men in the placebo group reported adverse events; gastrointestinal events, considered separately, were reported by 15.5% men in the Pomi-T group as opposed to 7.5% men in the placebo group. None of these differences were statistically significant. In this study, it was shown that men taking the whole food supplement (Pomi-T) had a significantly lower median percentage rise in PSA compared to men taking a placebo (P<0.0001). 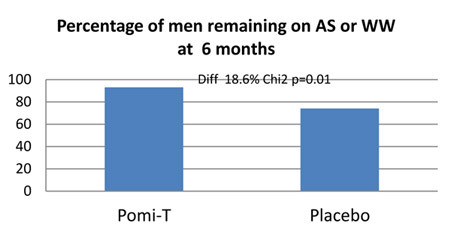 The difference in percentage rise in PSA between these groups from the start to end of the study was large (63.8%); and as the patient characteristics were well-balanced and the trial had sufficient numbers to ensure adequate statistical power, the results of this study offer clinically meaningful guidance for men contemplating nutritional supplements after prostate cancer. Future trials will look at continuing the intervention for longer and include men with different stage of disease.